As you know here at Boku Slots we are a sucker for a sequel and we have one waiting for you in the wings. Microgaming is back with its follow up to its 3-reel and 5-reel Break Da Bank games, with a mega spins version. Will it stand the test of time and trump the games that have gone before it, well let’s play Break Da Bank Again Mega Spins and find out? Break Da Bank Again Mega Spins is a 5-reel, 9 pay line slot that offers a 95.43% RTP to its players. So far it is very reminiscent of the 5-reel game, but there is one big difference in that instead of one set of reels on the screen there are 4. Bet Amounts – Betting on Break Da Bank Again Mega Spins begins at 1p per line in play. So if you play all 9 lines multiplied by the four screens, you are looking at 36p per spin. Not bad when you think about it. You can adjust the lines in play, the coin value and the coin level before every spin if you wish too. The maximum you will be able to bet is £360, so be very careful on your bet selections before hitting the spin button. Wild Symbol – The wild in Break Da Bank Again Mega Spins is the game logo and it will substitute for all other symbols, except the scatter. It will pay a 5x multiplier if forming part of a winning combination and during the bonus spins will offer a 25x multiplier on any wins it forms there. Scatter Symbols – A sturdy looking bank vault door forms your scatter symbol once again and by landing 3 or more, you will trigger the bonus spins feature. Landing just 2 scatter symbols on a winning line will award a 180 coin win and this can happen on multiple boards at the same time. As you can see if you manage to land 5 symbols on each board, then you will receive the maximum 100 spins. Not only that, but during the feature if you land another vault door, you will receive an additional spin for each one that is on the reels. This will extend your chances to win during the feature. All wins have a 5x multiplier attached during the feature and the wild symbol offers a 25x multiplier, if it is used to form a winning combination. 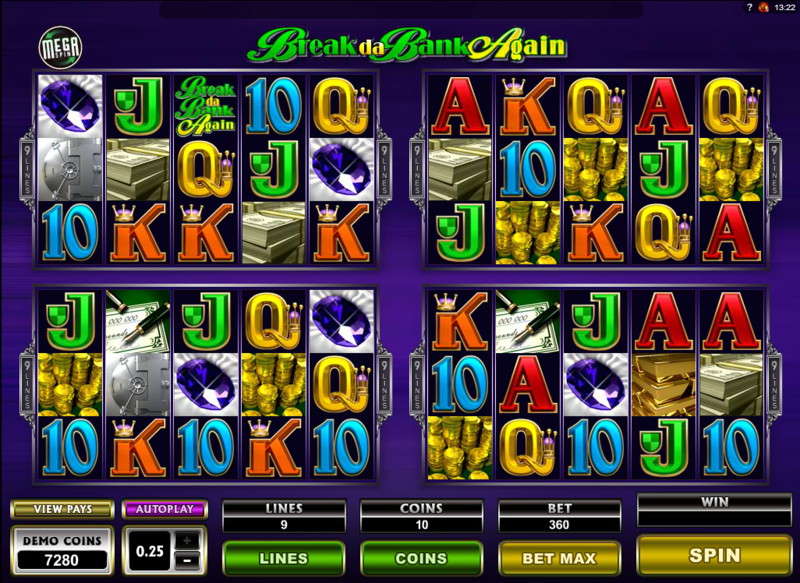 Break Da Bank Again Mega Spins showed great promise, but in reality it is just four sets of the same game playing out on the screen at once. The wilds and scatters pay the same as in its predecessor. If the bonus spins had also played out on 4 screens, then that would have given it a little bit of an edge. But aside from the fact that you were playing on 4 sets of reels, there was nothing else really to make it stand out. The wins didn’t trigger as often as we would have thought, with 4 sets of reels in play either. The only difference here was the amount of bonus spins awarded and that did prove a bit more profitable than the wins in the base game did.